Paradigm Award honorees are distinguished influential executives of profit-making enterprises with a strong local economic impact. Her leadership and dedication to a variety of interests contribute significantly to the socio-economic prosperity of the Greater Philadelphia region. She is respected in her profession and throughout the community for her commitment to excellence and her vision for women and future generations. 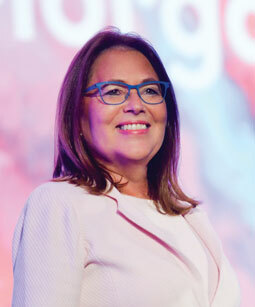 Reelected by the firm partnership to serve a second term as Chair, Jami herself is a lifelong member of the Morgan Lewis team, having begun her legal career at the firm in 1981. She has held various management positions, including membership on the firm’s Advisory Board. Immediately prior to assuming the chair, she led Morgan Lewis’s litigation practice, the firm’s largest group. She became Chair in 2014. During her tenure, Morgan Lewis has experienced unprecedented, and carefully targeted, growth throughout the world, which has placed Jami among the elite architects of strategic combinations in the legal industry. The firm’s more than 2,200 lawyers, patent agents, benefits advisers, regulatory scientists, and other specialists in 30 offices across the globe focus exclusively on delivering exceptional service to clients. A significant emphasis has been the establishment of a robust presence in Asia, Europe, and select centers in the United States. The firm’s careful growth is a direct result of her commitment to delivering the best possible services in the sectors and regions in which our clients do business. Morgan Lewis’s achievements under Jami’s leadership have won frequent plaudits from other independent analysts and publications. Recent accolades include recognition from BTI Consulting Group, one of the legal industry’s premier assessors of trends, as the #1 Innovation Champion among law firms. BTI, which bases its assessments on independent surveys of clients, has also bestowed numerous other accolades on Morgan Lewis, including, this year, for the third year in a row, naming multiple partners as Client Service All Stars, a recognition Jami herself won in 2017. The firm also has achieved national recognition from The American Lawyer, the legal industry’s most prestigious independent publication. Morgan Lewis finalists for the publication’s Global Legal Awards included Grace Speights, leader of the firm’s labor and employment practice, who is among three finalists for Attorney of the Year. Grace is among the foremost lawyers in the United States assisting clients in the era of the #MeToo movement. The firm also was named a finalist in the Best Use of Technology category for its Parallex innovation, a revolutionary data analytics program; Best Client/Law Firm Team for the firm’s partnership with Aramark; and Best Law Firm Business Team for its business operations team. A standout feature of Jami’s leadership has been her commitment to pro bono work that benefits the larger community in which Morgan Lewis offices are located. Last year, 100% of the firm’s lawyers worked on pro bono matters, while nearly all of the firm’s lawyers met the Morgan Lewis goal of committing 20 hours to pro bono work. The American Lawyer recognized Morgan Lewis as among the top eight firms in the United States in terms of its “breadth of commitment” to providing pro bono services and placed the firm among the top three internationally in the category. Each year, the firm also hosts a series of Community Impact Week events throughout its global network of offices, dedicated to supporting local initiatives. This year, under the theme “Helping Children Thrive,” the firm carried out more than 150 events to helping children, their families, and the nonprofit organizations that tirelessly support them. Throughout her tenure, Jami has promoted increasing the diversity of the firm’s leadership, as well as client teams in the knowledge that heterogeneous groups working collaboratively inevitably produce better solutions. To this end, she launched the ML Women initiative, which harnesses the strength of the firm’s women through partnerships with clients and to create opportunities for women to come together around a shared industry or practice. Today women manage many of the firm’s practices and offices worldwide and serve in the most senior firmwide leadership positions. Diversity initiatives as well are strongly supported, providing provide opportunities and mentorships for lawyers of a multiplicity of backgrounds. The firm is particularly proud to be recognized for its commitment in this area, winning the Justice & Diversity Center’s Outstanding Law Firm in Public Service Award, and being listed by Law360 among the Top 10 Best Law Firms for Women. The Paradigm Scholarship for Working Women, presented in conjunction with the Paradigm Award, is a merit-based scholarship that is awarded annually to women who are working toward an undergraduate degree.